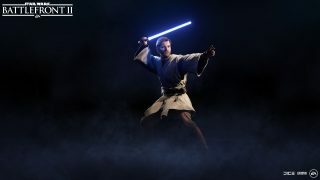 Obi-Wan Kenobi, Geonosis, the AT-TE, and more coming in the next Clone Wars update to Star Wars™ Battlefront™ II. 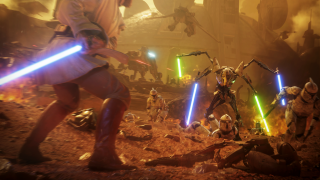 On November 28, the Battle of Geonosis update* arrives, dropping all players into one of the most intense Star Wars™ Battlefront™ II conflicts yet – on one of the most legendary frontlines of the Clone Wars. 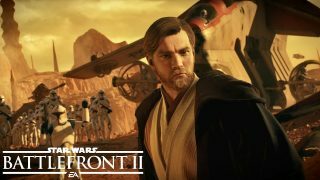 The update is headlined by the entry of Jedi Master Obi-Wan Kenobi**, the introduction of the all-new location Geonosis, the 212th Attack Battalion clone trooper Appearances***, and three extra vehicles to dominate and roam the Geonosian home world with. Fans of General Grievous won’t come out empty-handed this month either, as we’re expanding his collection of attires with the Shattered Armor Appearance***. We’ve previously covered Obi-Wan Kenobi and his Abilities, the making of Geonosis, and the new vehicles in-depth. Now, we’re giving you a roundup of all that – plus even more content coming with the Battle of Geonosis update. And as always, you can digest even more details in our latest Community Transmission. 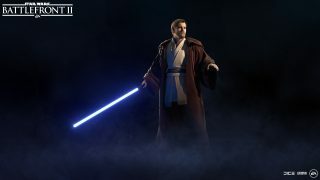 Obi-Wan Kenobi arrives with the default Jedi Master Appearance, and at his release, the Jedi Robes Appearance will be made available to unlock with Credits or Crystals as well. Later, on December 12, the additional General Kenobi Appearance is coming, too, inspired by the The Clone Wars animated show. Known as the setting of the first major Clone Wars conflict, a game of Galactic Assault on Geonosis will put players in the middle of a raging battle between the clone troopers of the Galactic Republic and the Separatist droid army. Starting in a rugged canyon with swarms of the native Geonosians whizzing above, the Galactic Republic must gain control of two objectives and call for reinforcements. If the Separatists are unable to halt their efforts, the battle turns into open warfare on the expansive, barren grounds. Here, Republic Carriers swoop in to drop AT-TE walkers on the surface, and the clone troopers must use the heavy artillery to abolish two Separatist Hardcell transports. If successful, wild dust storms will set off and set the scene for a final stand. The AT-TE walker is a six-legged battle tank, and the largest player-controllable vehicle yet in Star Wars Battlefront II. Once deployed in battle, a clone trooper can enter the walker straight from the ground. Packing a heavy punch, the AT-TE’s Abilities give players control of its Mass Driver Canon in Siege Mode, an Ion Charge primarily used to weaken the Hardcells on Geonosis, and a Tactical Support that buffs close-by team members. New speeders have also been added as part of the Battle of Geonosis update, providing mobility, speed, and firepower to their respective sides. The BARC speeder serves the Galactic Republic and is recognized by its aggressive, bulky design. The STAP, the Separatists’ more nimble-looking equivalent, can be used to roam the open grounds on Geonosis as well. The 212th Attack Battalion is coming to Star Wars Battlefront II as clone trooper Appearances for the Galactic Republic. The legion was recognized on the battlefield by the orange details applied to their armor and engaged relentlessly, led by General Obi-Wan Kenobi, in combat against the droid armies throughout the Clone Wars. 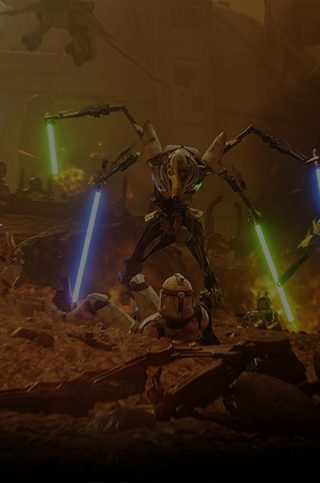 Hunted by the very same, General Grievous’ commitment to the obliteration of his enemies, whatever the cost, is displayed in his Legendary Shattered Armor Appearance – also coming with the Battle of Geonosis update. With a ripped cape, shattered mask, and smoke and sparks coming from his cybernetics, this unique look truly stands out from the crowd, and embodies the hard-earned conquests of the feared Separatist Supreme Commander. We’re excited to bring the Battle of Geonosis update to all players on November 28. Until then, remember to keep an eye on this space for full coverage of Star Wars Battlefront II.